The GPS ground segment may take a long time to detect and correct for faults and errors in the system while the user may be unaware of any malfunction until the condition is either corrected or a faulty satellite is indicating its fault status to the user receiver. This of course would be unacceptable in time critical navigation applications like aviation. 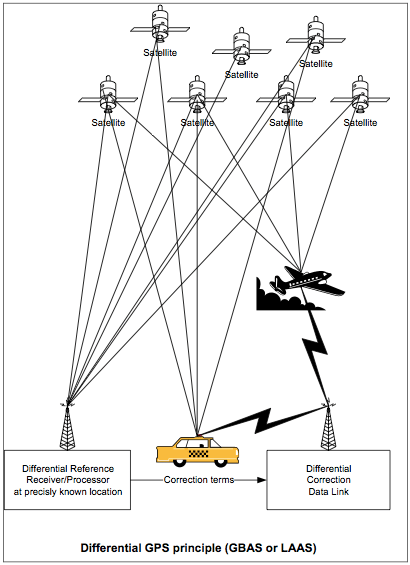 − With five (5) satellites in view the receiver would be able to detect one abnormal satellite pseudo range but could not tell which one of the five is wrong. − With six (6) or more satellites in view the receiver could identify and isolate a faulty satellite from the navigation solution. RAIM improves integrity of the navigation solution by alerting the user in case of errors and/or by preventing false information to be presented to the user. RAIM requires 5 or more satellites in view and thus would not be available all the time, depending on user present position, satellite geometry and obstacles blocking the view on satellites (buildings, terrain etc.). The RAIM technique interprets information about pseudo range errors in terms of induced horizontal position error and makes a decision as to whether the level of error is acceptable by comparing it to the allowable radial error for a particular phase of flight. This allowable error is termed the Alarm Limit. Several RAIM techniques or algorithms have been developed all leading to the same results in the end. Let’s skip that part and conclude that RAIM will determine whether the pseudo range of a satellite exceeds an expected value or threshold limit and alerts the user or excludes the satellite from the navigation solution. RAIM is a software algorithm and an integral part of the GPS receiver. RAIM Availability concerns the actual or predicted number of satellites in view, including an acceptable geometry (good HDOP), to satisfy RAIM requirements. An aircraft GPS receiver typically needs five satellites in view above an elevation mask angle of 7.5 degrees to provide RAIM. This condition is not always satisfied with the present Satellite constellation, and in these situations, RAIM would be unavailable. Adding measurements from other systems, however, such as GLONASS, LORAN, and IRS or barometric altitude, can increase redundancy, which effectively provide an additional measurement to test against. Predictive RAIM is the method of predicting, from the satellites almanac, whether sufficient satellites are in view at a given date and time in the future at a specified location. Predictive RAIM will not cater for satellite shielding by earth bound objects if the user is on the ground or below surrounding terrain level. Airborne GPS applications require FAA mandated RAIM to be available. The idea behind differential techniques is to correct for bias errors at one location with measured bias errors at a known position. A reference receiver, or base station, computes pseudo range corrections for each satellite in view. The fixed reference station knows its position precisely and takes GPS position readings from the orbiting satellites. By computing the difference between where the station knows it is and where the satellites tell it is, an error correction can be calculated. DGPS can thus improve accuracy by eliminating the effects of SA. Moreover, the reference station can directly identify faulty satellites and inform the users through the differential data link within seconds to not use specific satellites. Sending excessively large correction signals indicating a faulty satellite to the receiver does this. Because individual pseudo-ranges must be corrected prior to the formation of a navigation solution, DGPS implementations require software in the reference receiver that can track all SV’s’ in view and form the individual pseudo-range corrections for each SV. These corrections are passed to the remote, or rover, receiver that must be capable of applying these individual pseudo-range corrections to each SV used in the navigation solution. Applying a simple position correction from the reference receiver to the remote receiver has limited effect at useful ranges because both receivers would have to be using the same set of SV’s in their navigation solutions and have identical GDOP terms (not possible at different locations) to be identically affected by bias errors. Real time corrections can be transmitted by a radio data link in a standard format. Aviation will be using VHF data link channels in the existing VHF Navigation band (VOR/ILS) from 112 – 118 MHz. The receiver will likely be integrated within the GPS receiver housing. Private DGPS services use leased FM sub-carrier broadcasts, satellite links, or private radio beacons for real time applications. To remove SA and other bias errors, differential corrections should be computed at the reference station and applied at the remote receiver at an update rate that is less than the correlation time of SA. Suggested DGPS update rates are usually less than twenty seconds. DGPS removes common-mode errors (biases and propagation), those errors common to both the reference station and the remote receivers (not multi-path or receiver noise). Errors are more often common when receivers are close together (30 – 100km). Differential position accuracies of 1-10 meters are possible with DGPS based on C/A-code SPS signals while the integrity is also greatly enhanced. Providing sufficient accuracy and integrity for at least CAT I requirements, aviation may employ DGPS in the near future on non-instrumented Airports as a component for a GPS based Precision Approach and Landing system. Note however, that GPS and DGPS by itself remains an absolute position sensor not capable of providing ILS-like guidance signals to a runway threshold. To develop into a GPS based Landing System (GLS) a virtual path must first be defined and constructed by specified waypoints before some approach navigator can derive deviation signals to steer the aircraft. Leading the above GBAS development was the idea to enhance GPS integrity for aviation purposes through SBAS. Initially developed in the USA as the FAA WAAS, at the time of this writing still not operational due to repetitive delays in the development and cost overruns. 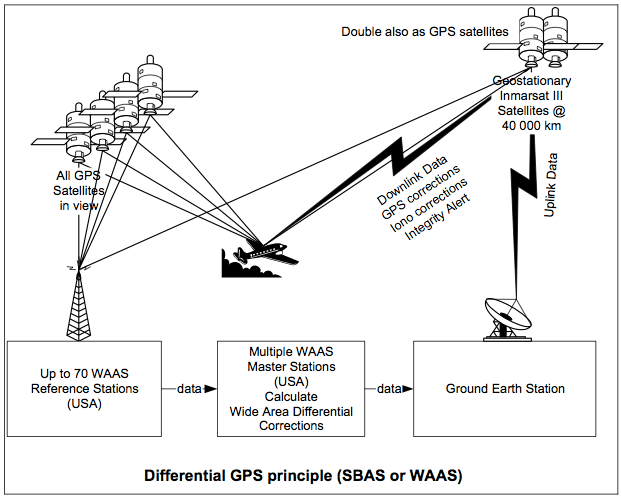 SBAS will use a network of ground stations over a large area e.g. the United States that all monitor the GPS satellites. Accumulated data will be collected, processed and up-linked to geo-stationary satellites high above the equator relaying the data to users in the geographic area potentially improving accuracy to 30 ft horizontally and 10 ft vertically (95%) and providing the integrity needed by aviation. These are the Inmarsat SATCOM satellites carrying an additional transponder payload storing the up- linked data and relaying this down to the GPS users in the specific coverage area (USA = LAAS). The first and prime purpose is to alert aviation users against GPS faults and failures within the required time to alarm. In addition this system may provide some improvements in accuracies although less than GBAS. Finally, the Inmarsat satellites can be employed as additional GPS satellites improving the number of GPS satellites received and the geometry at the same time. The completed system will add sufficient accuracy, integrity and availability to GPS to support wide area CAT I precision approach with a time to alarm within 5.2 seconds. In more critical applications like e.g. CAT III precision approach and landing there is the need to also improve upon availability, continuity and geometry of the GPS constellation to fulfil the more stringent certification requirements for flight critical operations. Adding more satellites would be the solution. Pseudolites do just that. Pseudolites are very much like ‘satellites’ located on the ground with a limited coverage area, e.g. located on the extended runway centre line below the final approach path, radiating upwards only. The signal transmitted is similar to the real satellite signals using the L1 frequency and reserved PRN codes for identification. The power must be very low to not saturate the receiver designed for the below noise signal levels from the real satellites. Pseudolites may ‘confuse’ GPS receivers that are not designed to use pseudolites. Pseudolites improve VDOP and PDOP and may act as the fourth satellite in the navigation solution requiring only three space satellites. To use pseudolites an aircraft GPS receiver would require an additional antenna at the bottom of the fuselage to receive the signal from down below. Pseudolites in combination with multi-redundant GBAS/LAAS are expected to grow towards the ultimate CAT III landing system of the future. Predictions indicate the 2015 timeframe as a possible target. For the time being the aviation industry is in a wait and see mode monitoring this development. Opinions vary with regard to the feasibility. It is a kind of paradox that adding more and more augmentations to the GPS to improve its fundamental parameters, at the same time worsen total system integrity. Europe is developing its own SBAS called EGNOS to complement the USA WAAS. EGNOS will also use Inmarsat III satellites for relaying the data. Completion is expected for 2002. It is the intention and planning to develop an independent European GPS controlled by civil authorities. This is called the GNSS-2 system that should make Europe independent from the USA military GPS. Redundancy in space would be created. USA FAA is planning to implement LAAS as an approach aid to replace ILS and/or MLS aids. Development to CAT I capability is ongoing and implementation is expected from 2006 onwards. Modular design should allow further development to CAT II and CAT III capabilities. Initially a single LAAS would cover a complete airport and the Terminal Area, however, for redundancy multiple installations would be required to prevent loss of IFR operation at an entire airport in case of failures. The next generation of 33 satellites will open several opportunities for improvement. More satellites improve continuity, availability and geometry. Multiple civil frequencies allow for real time ionosphere corrections and are more difficult to jam or interfere with. Removal of Selective Availability improves accuracy. Launch from 2002 onwards. Automatic Dependent Surveillance – Broadcast is the development of technology that allow aircraft to transmit the GPS derived position by data link to all surrounding aircraft and ATC centres. This is considered part of the future CNS-ATM environment leading to free flight. Development and trials are ongoing. Recently the large parcel operators executed extensive flight trials to proof that ADS-B may also be the better alternative for TCAS (not yet required on cargo aircraft). Cockpit Display of Traffic Information concerns the technology to display the traffic data derived from ADS-B in the cockpit of airborne and ground based aircraft and ATC centres to obtain a picture of surrounding traffic. Integrates the GPS position and time information in navigation, planning and execution. Improved accuracies in position and time lead to decreased separations, increased capacity, accurate noise reducing flight paths, improved air traffic management using Required Time of Arrival at waypoints, Required/Acquired Navigation Performance (RNP/ANP) capabilities of GPS. The GPS derived UTC may become the time standard on the aircraft automatically synchronizing the aircraft clocks when available. Accurate time and position information in all aircraft will ultimately lead to relaxation of separation requirements. Enhanced Ground Proximity Warning Systems use a terrain database to predict and alert for flight path conflicts with terrain potentially leading to CFIT. Optimum terrain separation requires accurate navigation indicating the aircraft present position in relation to the terrain. This safety improvement is enhanced with the GPS navigational accuracy. Present aircraft installations use the relatively simple GSP receiver with RAIM to provide the pvt output for further use. All augmentations and (potential) developments are mentioned to complete the picture and to signal future aircraft modifications needed to accommodate the different techniques. The ultimate goal is Satellite Navigation as Sole Means, eliminating all other man made aids to navigation. Some of the initial optimism has disappeared over the years and several known and legacy navigation systems will remain in use for the foreseeable future to cope with GPS failures. The aircraft navigation complement will therefore not change dramatically over the next decades. GPS will be added as an additional sensor, often with highest accuracy, to multi-sensor navigators like FMS. The marriage of the strong and weak points of GPS and IRS may lead an almost perfect navigation complement. The long-term accuracy of GPS complements the short-term stability of IRS. GPS to correct for IRS drift over time, IRS to initialise GPS for fast acquisition and to overcome short periods of signal loss coasting the GPS through. Other navigation sensors like DME and VOR degrading to a fallback or backup status. This chapter will certainly require some updates in the future.